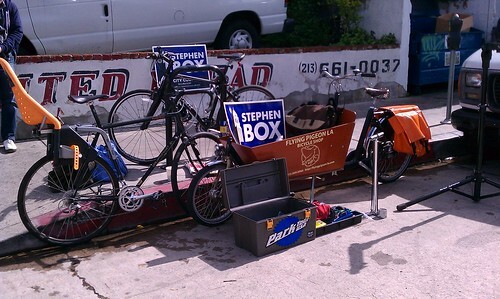 Stephen Box, candidate for LA council district 4, is partnering with the Flying Pigeon LA bike shop to provide free bike repair and service at this Sunday’s Hollywood Farmers’ Market (located at 1600 Ivar Avenue, Los Angeles, CA 90028). All general service and maintenance (as well as small parts like tubes, cables, patches, nuts, bolts, brake shoes etc.) will be free of charge. No tires or large components will be on hand (hey, we’re carrying everything by bike!). Stephen Box is the 4th council district’s strongest supporter of a more livable Los Angeles. Find out more about Stephen on his official campaign web-site.